It’s been a little quiet on the blog for the past couple weeks. As some of you may know we added another beagle to our home so I’ve been busy chasing around two mischievous little beagles. Now that things have calmed down a bit and Jake and Sadie have adjusted really well with each other I can get back to being crafty! But…failed projects usually bring out new inspiration. I’ve been working on designing some new amigurumi patterns that just aren’t as good as I want them to be yet and it could be weeks before I feel they are blog worthy so I got to thinking….not everybody knows what amigurumi is! And I also thought it would be fun to share some tips and tricks that I wish I would have known when I was first learning amigurumi. So what is amigurumi anyway? Amigurumi is the Japanese art of crocheting little creatures/objects such as animals, people, food, characters…anything really, the possibilities are endless!! Do a google search of “amigurumi ___?___”, and trust me you will probably find it. Once you enter the world of amigurumi you will be obsessed and your life will change forever! Part of the reason I enjoy this type of crocheting so much is that its typically easy and the projects are small and can be made in a relatively short amount of time. And, kids love them!! They make really great gifts, and are always a conversation starter. 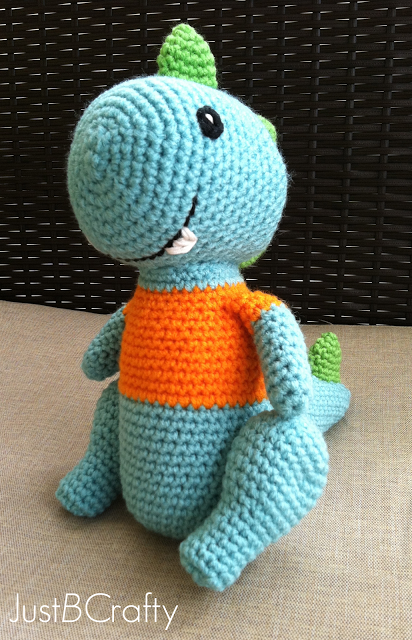 Generally, amigurumi projects are comprised of single crochets in the round with increases and decreases. Each piece is crocheted, stuffed, and closed off. Then all individual pieces are sewn together with a yarn needle. 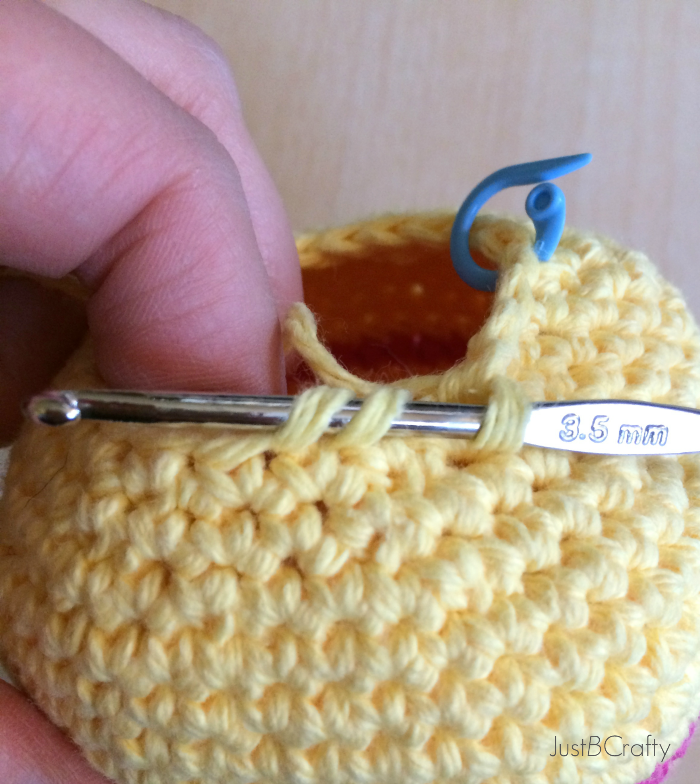 I share some helpful tips on attaching amigurumi limbs here. What is the secret to perfect amigurumi? I guess maybe perfect isn’t the word I should use here as it’s the little imperfections that make handmade things beautiful, but you can get pretty darn close! My crocheting skills are far from perfect and I am by no means an expert! But, I am telling you these tips have made a world of difference in my skill and I hope they help you too! 1. 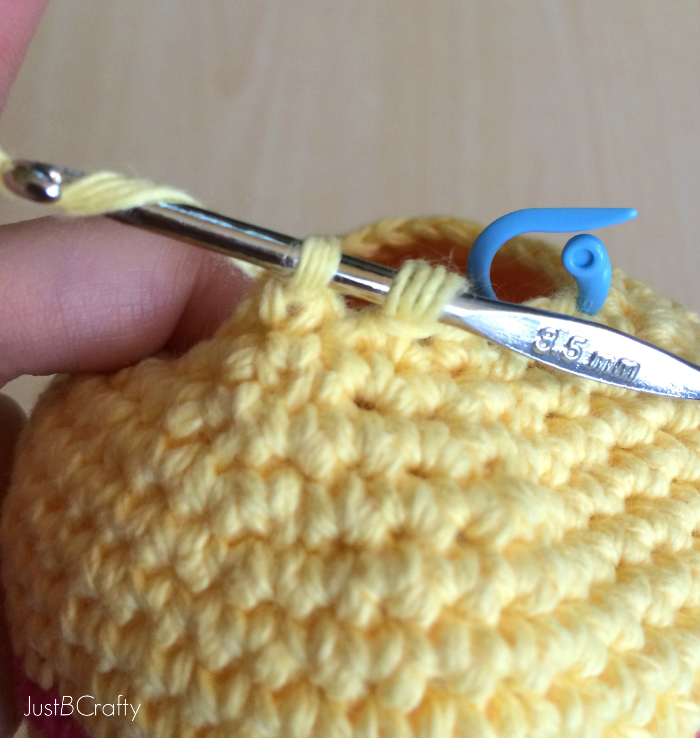 Use a tiny crochet hook! I use a 3.5 mm hook and worsted weight acrylic yarn, usually Red Heart because it’s cheap and comes in almost every color. The tiny hook really makes the yarn cling to itself really well so that the holes between stitches are basically non-existent. My first couple of projects I used a 5 mm crochet hook and they just didn’t look as nice as the projects made with a smaller hook. Kind of self explanatory…just keep crocheting. It’s crazy how much my skills have improved from my first projects from just practicing. 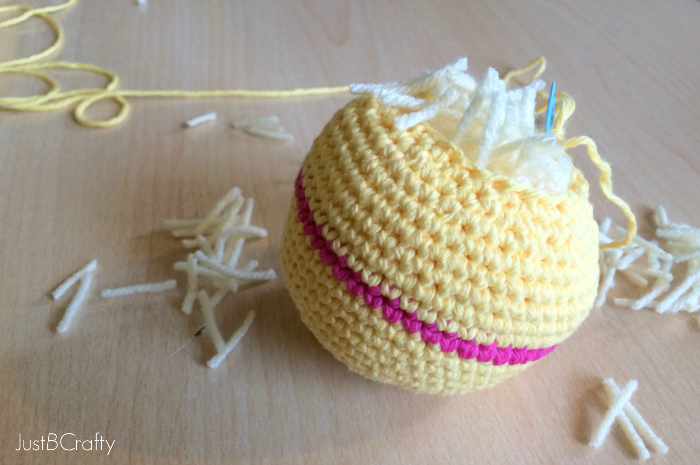 The pattern for the ball below is a great project to practice your amigurumi skills! This is probably my favorite and most useful tip….the invisible decrease! You may be already doing it but if you’re not, listen here friend!! I definitely wish I had known about this when I had first started making amigurumi projects because it has made a world of difference. 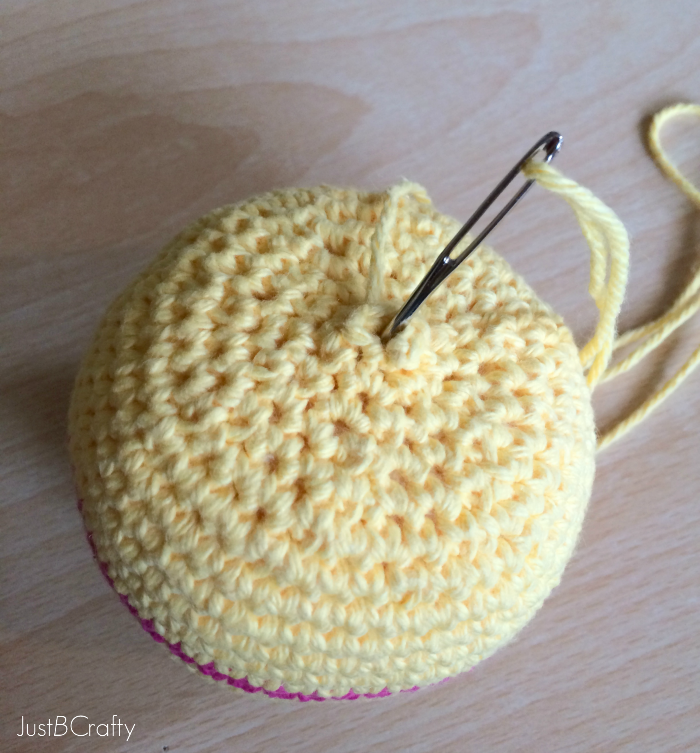 The normal decrease leaves a big bulky stitch that does not look uniform with the rest of the project at all. For the longest time I could not figure out why my projects weren’t looking like the picture in the pattern and now I know why…I was not doing the invisible decrease. It’s almost like it’s a secret or something. 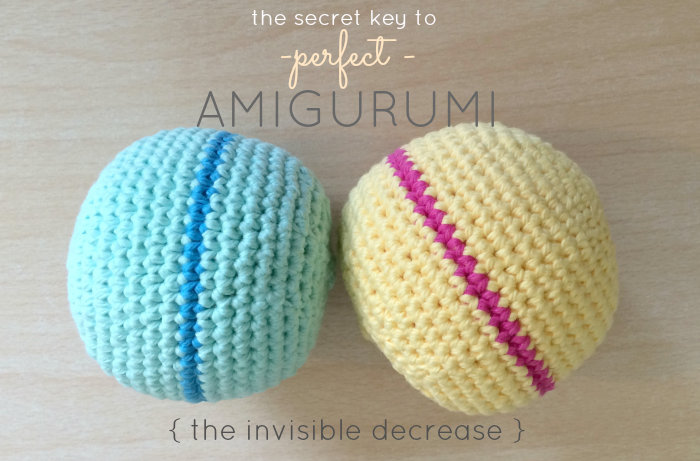 Amigurumi patterns don’t typically specify the type of decrease, they just say “decrease”. 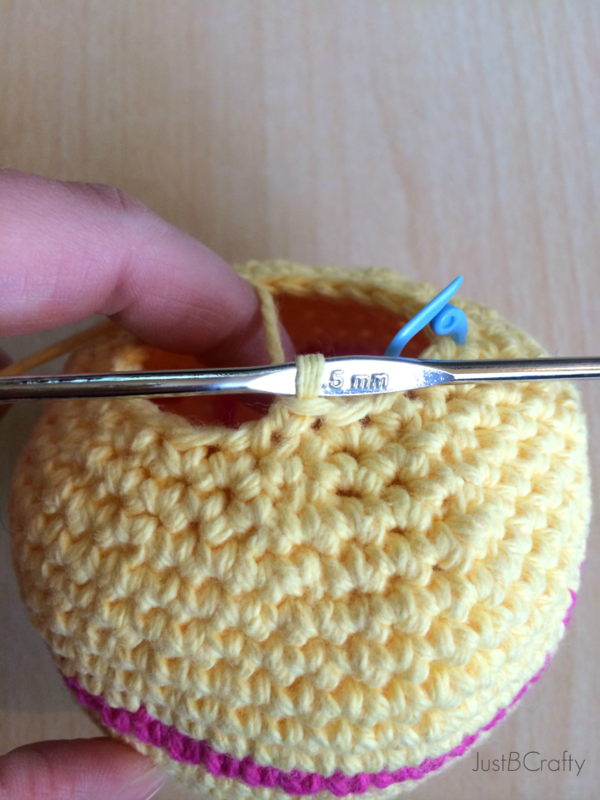 So for you crocheters out there who are new to the world amigurumi here’s the tutorial. 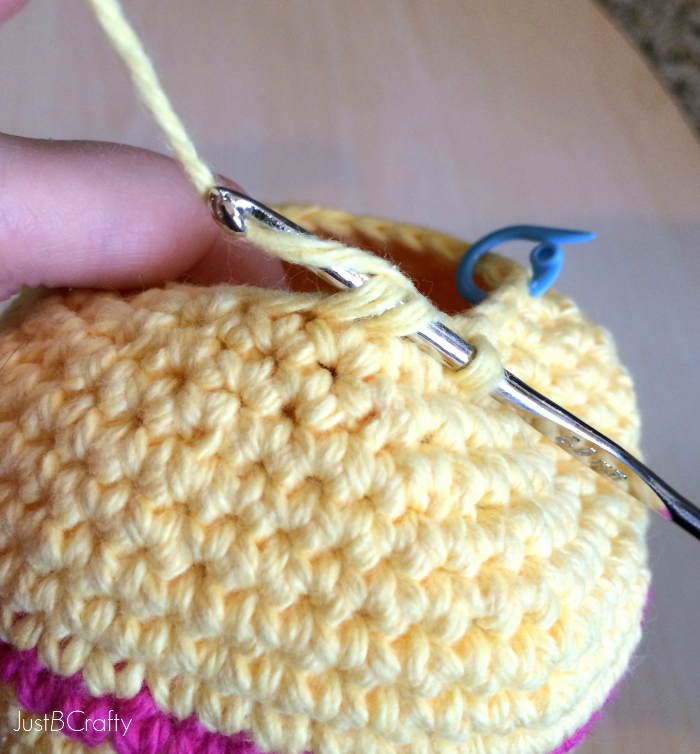 Once you get to the point where you want to decrease, insert your hook into the outer loops of the next two stitches. Now the hook is inserted into the next two stitches. Loop working yarn around hook and pull through those first two stitches on hook. You have just made an invisible decrease! 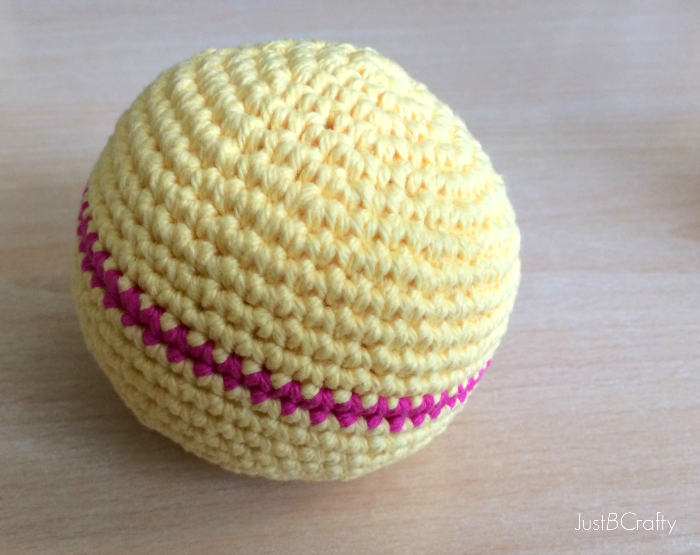 To practice this new skill here is the pattern for a basic amigurumi ball. If you are just learning and want to leap into the world of amigurumi, this basic pattern is the foundation of most amigurumi projects. If you get this down, you can make anything! Cut yarn and attach contrasting color. Cut yarn and attach main color. Start to stuff with scrap yarn or fiberfill. Cut yarn and secure. Weave in yarn ends. And that’s all folks, you have an amigurumi ball! 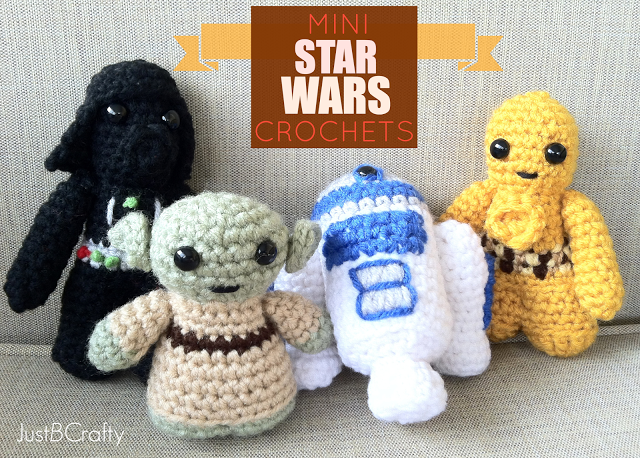 Interested in some other amigurmi projects? Check out the ones I’ve tried out so far! 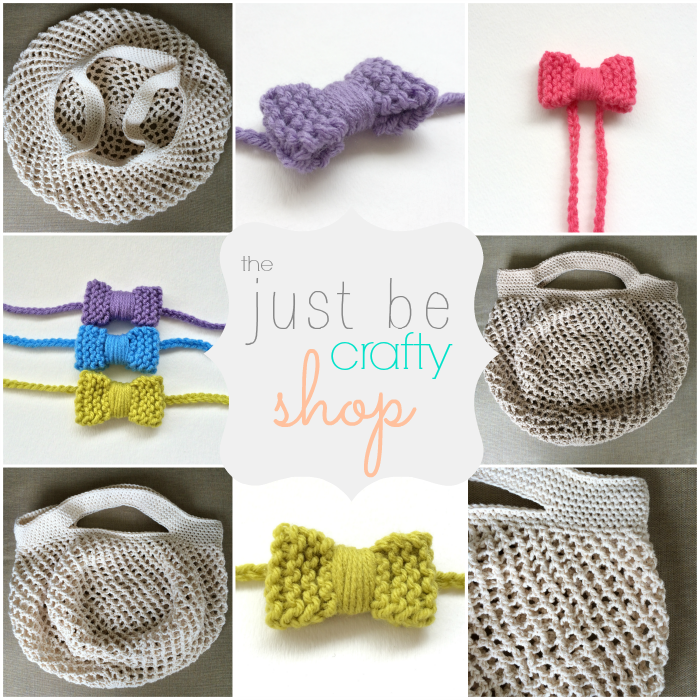 Visit the Just Be Crafty Shop! Oh yeah, I party here! « Loopy Bath Time Mitts + GIVEAWAY Winner! Gorgeous! So perfect! 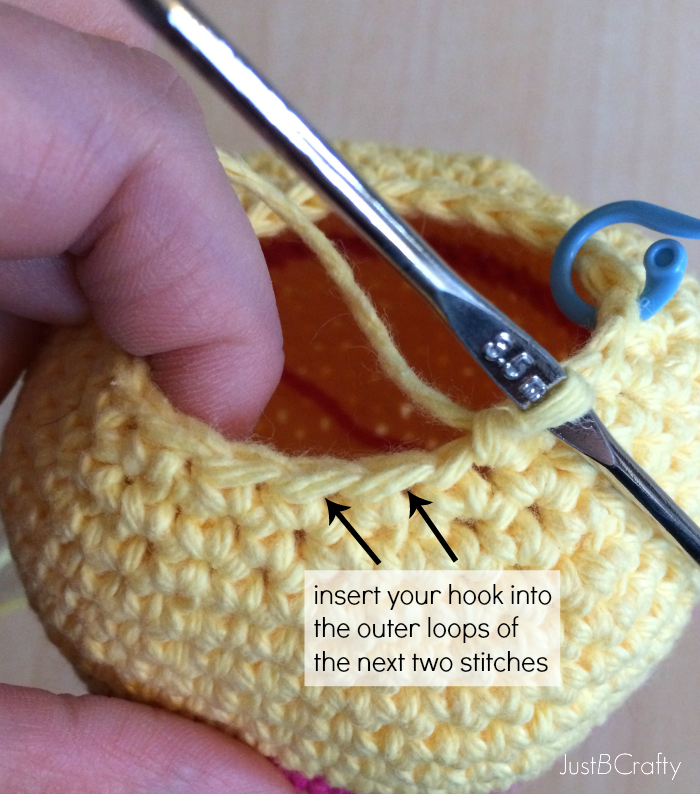 Great info too 🙂 The whole crochet world is new to me, but I really want to learn! Once again your work is great, plus I'm always a fan of your beautiful pictures! 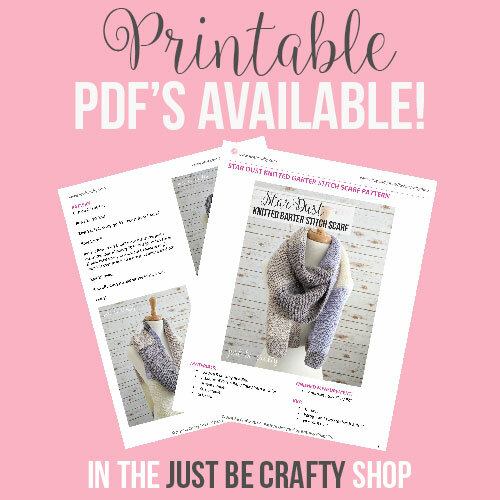 I'm clueless when it comes to crocheting, but your projects inspire me to learn … absolutely adorable!! I am obsessed with the star wars croheted guys! Ok ok but I love these balls too, great pattern!! 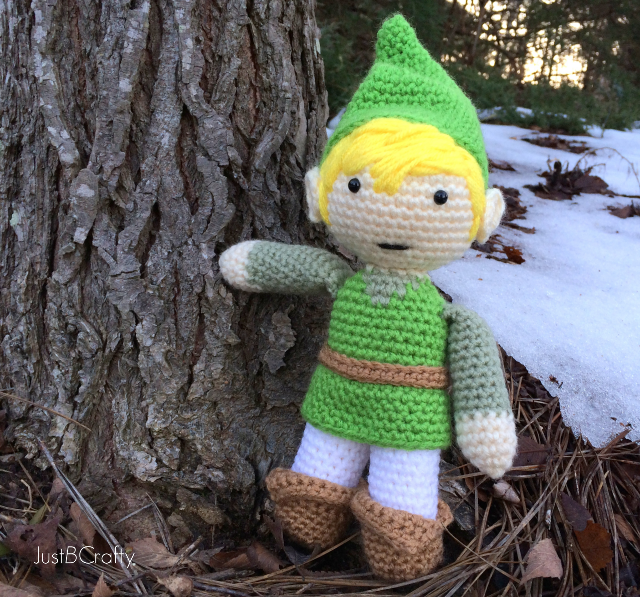 That Legend of Zelda crocheted character is too cute! My kids would love that! Im featuring this post tomorrow at Link it or Lump it! THanks for linking up Brittany! Good I’m glad! I hope you give amigurumi a try…it’s so much fun!! No sé que tanto pueda hacer pero, lo que sí te digo es que me motiva mucho para emprender el proyecto, ya luego te cuento como me ha quedado. Gracias. What a relief to find out I'm not the only who spends so much time unraveling projects which did not turn out as I had pictured them in my mind. This is so useful, i have been decreasing in a different manner, but will give this a try. Thanks for the tip. thank you for sharing this information! I couldn't figure out why when I did an decrease I would get these holes that showed my stuffing when I was done! I've got to try this out and see if that's what was causing my problem. What size is this ball? How big is the ball in this pattern? I am trying to make a smaller version of a basketball. Probably a little bigger than the size of a hand. How would the increase go? Thank you. Thank you for sharing the pattern and information. Hi Anna! This ball is approximately the size of an orange, you would keep increasing in the same fashion as the pattern lists until you reach the circle width desired, then complete a few rounds of sc without any increases, and then begin decreasing. That’s the way I approach things that are new to me – like I’m just playing around to see what happens. Stops me from getting too discouraged. (Sometimes I call myself scribblewoman to keep myself in the ‘playful zone’ hehe). Just finished this pattern, and the decrease was new to me. I should have started on these so long ago! I much prefer this decrease, and this was fun to make. 🙂 I used shredded plastic bags (like Walmart bags) to give the balls a “scrunchy” feel and sound to them, and so that my baby’s drool wouldn’t make the filling gross. Thanks for the great lesson, and cute pattern!! I plan on making more of these soon to add to Christmas presents for all the younglings in my life this year. Yay!! Great tutorial! But I have one question. I’m to the point where I want to start making my own patterns but I’m sometimes having a difficult time understanding why patterns are written the way that they are. For instance with the ball, why do you start increasing in every 3rd or 4th stitch and not just every other stitch throughout the whole piece. I would really like to be able to understand why it’s done in that specific way so I can begin to use those shaping techniques to my advantage. I need to be able to deconstruct the pattern in order to learn how to write my own, lol. Another way I do it is to go by multiples. When I first learned to make amigurumi I did everything in multiples of 6. Play around with that (multiples of different numbers) and you will see different results. I like the way Brittany does it as well. Instead of multiples they go up by adding a certain number. For instance, for the ball it goes up by adding each of the following numbers to each row spread out evenly (4, 6, 6, 8, 8, 10). It’s like math sculpture. Thanks so much! At first I was doing it wrong, essentially making a double crochet dec, then I reread because it didn’t look right. Once you do it right it’s so magical. Hah. Hi Katie! Thanks for your comment! Mathematically row 5 should always come out to 40 stitches. Your row 4 should be ending with 32 stitches. On row 5 you will be increasing in every 4th stitch, so if you take 32 stitches and divide by 4 that comes to be 8 stitches. This means you are adding 8 stitches in that round. Adding 32 plus 8 stitches will give you 40 stitches by the end of row 5. If you have any other questions please reach out!! Please explain what is a magical ring ? Please explain what is a magic ring ? Below is my video tutorial on the magic ring/magic loop. I have seen and used the magic ring before, but only to create the ring itself, not the first round of stitches, which, in this case, was sc. then I could do what I needed, into the ring. I found this magic ring really tricky, and wonder if it’s because it’s a magic ring and 8 sc, not just a magic ring. I’m a beginner, so rhat confused me a little, as well as the thread only being wrapped around the index finger. I had trouble seeing which yarn was doing what. That’s the same link as the one I used, that I found hard to follow. I have figured out how to do it though, and then do the 8 dc into the ring as a separate ‘step’, so the ring is clear. I think the index finger is the issue, in the other one I watched, the yarn is thread around a couple of fingers, so it’s really clear (to me!). Aha! THANK YOU SO MUCH! I could not figure out why my decreasing half always seemed so chunky and weird and my increasing side looked so perfect! Your explanation of an invisible decrease was fabulous! Off to make pokeballs and maybe move on to a creature of some sort!!! Yay! I am so happy you found this helpful! Have fun crocheting your Pokeballs! I am making Xmas ball and was really discourage with my decrease. Can’t wait to try this. ?Thank You for your post!! I hope you do! I think you will really like the results! Let me know how it goes :). The first time I’ve managed to make a sphere that ends up looking like a sphere. Loved this pattern. If I knew how to attach a photo I’d show you what I ended up with. I’m not on insta sorry. I do wonder though, where your colour join comes in, how does it look on the finished ball? I find mine has a ‘stepped’ look, so wonder if that’s normal or not. I’ve shared a few pics on my dog’s FB page though, and so far have shared your pattern with those who’ve asked, it is popular!